During the 2015–16 school year, New America’s Open Technology Institute (OTI) and Education Policy program partnered with the IT staff at Alexandria City Public Schools (ACPS) in Virginia to conduct a pilot study as a first step toward addressing this challenge. The study, Measuring Broadband in Schools, looked at the complexities of understanding network capacity in education institutions, and sought to better understand the challenges of measuring network capacity at the point of use in schools. 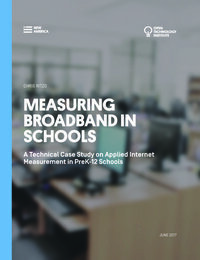 The study leveraged the open source tests, tools, and open data provided by Measurement Lab (M-Lab) to measure broadband speeds in Alexandria’s classrooms. M-Lab is an open data platform for internet measurement that is run by OTI in partnership with Google and Princeton’s Planet Lab. New America researchers prototyped a device-based measurement system, and, over a two-month period during the spring 2016 school semester, developed and installed small computers to collect network performance measurements from classroom connections in multiple ACPS school buildings and classrooms. Using a well-known internet measurement test, the Network Diagnostic Tool (NDT), the research team gathered quantitative data on the performance of the network. The goal was to pilot a low-cost, open-source, and reproducible method for assessing the broadband infrastructure in an educational setting. This work built upon OTI’s previous policy recommendations to the Federal Communications Commission (FCC), advocating for open and accessible measurement and evaluation tools within schools and libraries receiving E-rate funding. The E-rate program, which was authorized with the Telecommunications Act of 1996, subsidizes some of the cost of telecommunications and information services for schools and libraries. In 2014, the FCC increased funding to $3.9 billion annually to schools and libraries to meet their goal of high-speed connectivity, along with another $2 billion in multi-year funding to support Wi-Fi upgrades. To ensure these connectivity goals are met, school districts and other public institutions need data and methods of analysis to understand how their networks perform and where capacity may need to grow in order to support the needs of students and instructional staff. Within school districts, IT managers and administrators often have the dual role of architecting and implementing technology solutions as well as assessing, planning, and budgeting for the future. Balancing day-to-day infrastructure and instructional technology support with data gathering and assessment is challenging, even for well-staffed districts. Data about network performance, however, are critical to the annual funding requests districts make to the E-rate program. OTI has long advocated that the FCC “improve data collection and measurement tools so that E-rate participants, researchers and policymakers can better understand and analyze the program.” 7 The challenge of building, maintaining, and upgrading schools’ broadband networks and their connection to the internet is no small task. In addition, consistently and accurately assessing capacity in order to balance instructional needs with available technology budgets is always a challenge. As the use of technology to supplement instruction in PreK-12 education has become more common, the need for network performance data at the classroom level has intensified. The internet is used for instruction in increasingly diverse ways, for everything from assessment and student performance tracking, to one-to-one initiatives that support flipped classrooms and blended learning instruction. As teachers come to depend upon these new technologies for daily instruction, inadequate service can significantly disrupt teaching and learning. This pilot project is intended to be a prototype toolkit to address the need for classroom level speed data, that can be extended and improved through future collaboration with relevant communities of interest. School districts lack network measurement tools. New America researchers hypothesized that school districts lack much-needed network measurement data, and this was reinforced by IT staff at ACPS. A system to conduct network testing and methods to analyze the data would be very useful. School networks present unique technical challenges for network measurement. This pilot helped uncover technical hurdles to measuring network health within a highly managed network. From opening firewall ports to testing device drivers, the study has enumerated several lessons learned that will be helpful for future work. Network management practices should be considered in any measurement program. Initial data analysis found Quality of Service (QoS) network management rules had placed bandwidth limits on most classroom connections. Inventorying the network and understanding what network management practices are in place is paramount in the design of any measurement system. 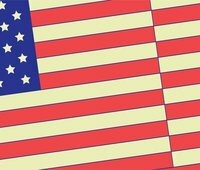 Upstream ISP peering may affect school network performance. The issues teachers or students experience when accessing online content, testing platforms, or other online services are typically thought to be caused by poor performance of the school network or available bandwidth. However, our findings confirm that issues accessing content online can be caused by factors beyond the control of the school. The path to content and the hosting/peering arrangements of content providers and Internet Service Providers (ISPs) also affect the delivery of content, notwithstanding the considerations schools make in provisioning their networks. Performance measurements should be compared with data on network capacity. While measurements of internet speeds are important, understanding them in the context of network capacity is still lacking. Client measurements AND data on the utilization capacity of the network would help to demonstrate how client measurements relate to overall capacity. The outcomes of the pilot, as well as the challenges encountered in conducting it, will contribute to future research and iterative design of the data collection system. Recommendations for improvements to the system largely concern scalability. Ideas to refine the prototype data collection system were identified, both for the device placed in schools and the server that coordinated the test schedule. The direction for future work on the measurement system largely centers on device management, and remote administration, but also includes ideas for additional tests to conduct and data to collect for comparison and analysis. A more full-featured, cloud-based service to replace the server component used in the pilot is recommended. Finally, New America Researchers discuss the formation of a community of interest around a network measurement and analysis toolkit for schools and public institutions, which New America researchers are engaging in with members of the academic community and with the Internet2, U.S. UCAN program. Download the companion piece to this case study, From Online Testing to Online Learning, by Lindsey Tepe. Visit the Measuring Broadband in Schools project page to learn more about the pilot project.